Sometimes spending your weekend at home is just plain boring. There really isn’t much to do, but on the other hand you don’t have much of time before the weekend is over and it’s back to work again. How about a weekend RV getaway close to home? 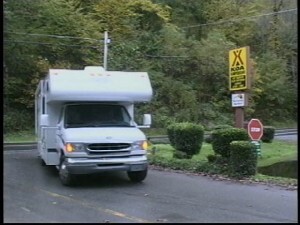 Not only can a quick RV trip alleviate the boredom, but it is cost effective too. A 200 mile, or less, round trip from home won’t cost much in fuel, food or campground fees and it might be just what the doctor ordered for some well deserved relaxation and time to recharge. Lots of times, when planning RV trips, we tend to think you have to get away from home for it to be any fun. Truth be told there are probably lots of private and public camping locations and other fun destinations right under our noses that we’re not even aware of. Using its “Find Camping Spot” feature I searched for RV sites close to our zip code. Sixteen choices within 100 miles of our zip code popped up immediately. You can scroll down the listing and click on the campgrounds that interest you to get detailed information on the description, services and amenities each have to offer. The “Find Camping Spot” search feature allows you to get more specific too, like searching by park name, dates, length of stay, amenities, size of RV and much more. Quite honestly I was surprised to find so many camping destinations so close to home. With sixteen choices within 100 miles of where we live I think there will be many more cost effective weekend RV trips in the near future. It really doesn’t matter if it’s a 200 mile, or 5,000 mile trip, what’s important is you use and enjoy your RV.